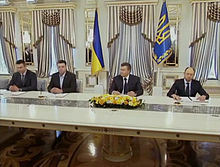 Creating Agreement on settlement of political crisis in Ukraine – the documents, signed on 21 February 2014 by the President of Ukraine Viktor Yanukovych and the leaders of the parliamentary opposition under the mediation of the European Union and the Russian Federation. The signing of the Agreement was intended to stop the mass bloodshed in Kiev and to end the sharp political crisis, which began in November 2013 in connection with the decision of Ukrainian authorities to suspend the process of signing the Association agreement with the European Union. An agreement to resolve the political crisis was signed by the President of Ukraine Viktor Yanukovych and opposition leaders Vitali Klitschko (Ukrainian Democratic Alliance for Reform), Arseniy Yatsenyuk (All-Ukrainian Union "Fatherland") and Oleh Tyahnybok (Svoboda). Witnessing the signing was made by the foreign Ministers of Germany and Poland – Frank-Walter Steinmeier, Sikorski and head of the Department for continental Europe of the Ministry of foreign Affairs of the French Republic Eric Fournier. Special representative of the President of the Russian Federation Vladimir Lukin, who participated in the negotiations, refused to put his signature under the agreement. The agreement provided for a return to the 2004 Constitution, that is, to a parliamentary-presidential form of government, the holding of early presidential elections before the end of 2014 and form a "government of national trust". Also provided for the withdrawal of security forces from downtown Kiev, the cessation of violence and surrender of weapons by the opposition. Signing the Agreement on settlement of political crisis in Ukraine. 21 February 2014. 1. Within 48 hours after the signing of this agreement will be adopted, signed and promulgated a special law that will restore the action of the Constitution of 2004, as amended by this time. The signatories declare their intention to create a coalition and form a national unity government within 10 days thereafter. 2. Constitutional reform balancing the powers of President, government and Parliament will be started immediately and completed in September 2014. 3. Presidential elections will be held immediately after the adoption of the new Constitution, but no later than December 2014. Will adopt a new electoral law, and also formed a new composition of the Central election Commission on a Pro rata basis in accordance with the rules of OSCE and Venice Commission. 4. Investigation into recent acts of violence will be conducted under the overall monitoring of the authorities, opposition and the Council of Europe. 5. The authority will not impose a state of emergency. The government and the opposition will refrain from the use of force. The Verkhovna Rada of Ukraine will adopt the third act exemption, which will be distributed at the same offences as the law of 17 February 2014. Both parties will undertake serious efforts for the normalization of life in cities and villages by releasing administrative and public buildings and unblocking streets, squares and plazas. Illegal weapons should be handed over to the authorities of the Ministry of internal Affairs of Ukraine in the 24 hours since the entry into force of the above-mentioned special law (section 1 of this Agreement). After this period, all cases of illegal carrying of weapons fall under the current legislation of Ukraine. The strength of the opposition and the authorities will move away from positions of confrontation. The authorities will use force of law exclusively for the physical protection of buildings authorities. 6. The foreign Ministers of France, Germany, Poland and the Special representative of the President of the Russian Federation are calling for an immediate end to all violence and confrontation. From the opposition: the leader of the Ukrainian Democratic Alliance for Reform Vitali Klitschko, leader of All-Ukrainian Union "Fatherland" Arseniy Yatsenyuk, leader of Svoboda Oleh Tyahnybok. From the European Union: the Federal Minister for Foreign Affairs Frank-Walter Steinmeier, Marshal of the Sejm Sikorski and head of the Department for continental Europe of the Minister for foreign Affairs of the French Republic Eric Fournier. President of Ukraine Viktor Yanukovych signing the Agreement, 21 February 2014. Vladimir Lukin, explaining the non-signing of the agreement, stated that "Moscow has decided not to sign these agreements for a very valid reason, actually – don't really understand the situation with those who are the subject of this agreement," agreement "is not visible forces and those who have to implement"
On 21 February, with a public announcement on the Maidan leaders of the parliamentary opposition of the signed Agreement, one of the activists of "self-Defense Maidan" Volodymyr Parasyuk said that he and "Maidan self-Defense" not satisfied specified in the document the gradual political reforms, and demanded the immediate resignation of President Yanukovych – otherwise he threatened to storm the presidential administration and the Verkhovna Rada. This statement was met with applause. The leader of the "Right Sector" Dmytro Yarosh stated that the Agreement does not provide a clear commitment to the President's resignation, the dissolution of the Verkhovna Rada, the punishment of heads of law enforcement agencies and artists ""criminal orders, which were killed about a hundred Ukrainian citizens", he called the Agreement "another tamilvanan eyes"" and refused to perform. On the night of 22 February Euromaidan activists placed under security the government quarter as law enforcement were abandoning it, and has put forward a number of new requirements – in particular, demanded the immediate resignation of President Yanukovych. Later, the Russian President Vladimir Putin praised the agreement as a practical surrender of power – Yanukovych agreed to all demands of the opposition. Viktor Yanukovych: "the Opposition and radical forces, which were submitted on the Maidan, and not only on the Maidan, but also in other regions, they had to disarm, vacate all the occupied territories. But it was not implemented. And, as a result, Kiev was overrun by armed men who began to smash home, religious institutions, temples, began to suffer completely innocent people. People just on the streets robbed and beaten. And it continues today. So the agreement for us, of course, gave some hope. But everything that happened next, it's difficult to call any epithets". Appeal from the 28 March 2014 Yanukovych said: "I Will seek the lawful execution of the agreement of 21 February and will make every effort to get organized this farce was completely exposed and those responsible for the collapse of the state duly punished". 2 April 2014 Yanukovych gave an interview to Russian and foreign media, during which he said, "Immediately after signing the agreement, I began to fulfill that part of the obligations, which took over the power. As President, I, without delay, given the job of the police to retreat from the square. His radical part responded by shooting... <...> When I signed the agreement, I was doomed to carry it out. And I believed that the guarantors, the foreign Ministers of EU countries will also fulfil their obligations. I had no idea that it was a trap for the government, for the President of Ukraine, because this night I began to attack the militants in the open with weapons ... that I'm alive, first and foremost. But I even did not hear words of condemnation against the bandits, who were called activists". Arseniy Yatsenyuk and President Barack Obama in the Oval Office. 12 March 2014. The Verkhovna Rada appointed Prime Minister of Ukraine Arseniy Yatsenyuk: "the First basic commitment was about the return of the 2004 Constitution, but the next day Viktor Yanukovych has publicly refused to sign the bill and walked out of this Agreement"; "the government of Ukraine was formed, as allowed by the Agreement, namely the inclusive government, which received even the new opposition in the face of the Party of regions. Constitutional majority 371 votes in the Parliament voted for this government". Professor of law, one of the developers of the Constitution Viktor Musiyaka: "first, he within 48 hours from the moment of signing of the agreement with the opposition has not signed adopted by the Verkhovna Rada of Ukraine the Law on the renewal of the Constitution of Ukraine as amended on 08.12.2004 G. That he actually disavowed his signature to the agreement and made it legally null and void". "Yanukovych, had to say about the unconditional execution of their powers and even to veto the laws passed by the Parliament. But for this he was necessary to remain in the workplace". U.S. permanent representative to the UN Samantha Power: "It was Yanukovych violated the terms of this agreement, after leaving Kiev, and then Ukraine". Press conference of Russian President Vladimir Putin on the situation in Ukraine. 4 March 2014. The next day, 22 February 2014, Minister of Foreign Affairs Sergei Lavrov urged the foreign Ministers of Germany, France and Poland Frank-Walter Steinmeier, Laurent Fabius and Sikorski to put pressure on the Ukrainian opposition to implement the Agreement to resolve the political crisis in Ukraine. The Russian President Vladimir Putin, speaking about the actions of Yanukovych: "... He gave the instruction to withdraw all police forces from the capital, and they complied with his order. He went to the event in Kharkiv, as soon as he had gone to Kharkiv, instead of the release of previously occupied administrative buildings, immediately seized and his presidential residence, government building, instead of trying to fulfill what we agreed". Minister of Foreign Affairs Sergei Lavrov: "According to this agreement, the authorities refused to impose a state of emergency, were removed from the streets by law enforcement. The opposition has done nothing. Illegal weapons handed in were not, public buildings and streets of Kiev not fully exempt, the radicals continue to control the city. Instead of the promised creation of a national unity government announced the creation of a government победителей". 5 March 2014 Sergey Lavrov had a meeting with Secretary of state John Kerry. According to the Russian diplomat, they agreed on the necessity of implementation in Ukraine of the agreement of 21 February. Also in the plans of Russian Foreign Minister meeting with the foreign Ministers of France, Germany and Poland, witnesses at the signing соглашения. The foreign Ministers of Germany, France and Poland urged the new Ukrainian government to respect the Agreement of 21 February: "As intermediaries for the conclusion, we call on the Ukrainian authorities to do everything possible to the basic principles contained in the document became part of the Ukrainian policy". This is a joint statement by Frank-Walter Steinmeier, Laurent Fabius and Sikorski made in Germany by the end of the meeting 31 March 2014 года. ^ Полный текст Соглашения оппозиции и Януковича [Full text of the Agreement of the opposition and Yanukovych]. tvi.ua (in Russian). 21 February 2014. Archived from the original on 22 March 2014. ^ Parubiy: "We demand the immediate resignation of Yanukovych." ^ "Clarification on the situation in Ukraine (March 4, 2014 г.)". Archived from the original on 5 March 2014. Retrieved 11 April 2015. ^ Power, Samantha (3 March 2014). "Remarks by Ambassador Samantha Power, U.S. Permanent Representative to the United Nations, at a UN Security Council Meeting on Ukraine, March 3, 2014". U.S. Mission to the United Nations. Archived from the original on 29 March 2015.